Some days you will roll up into a shoulder stand, other days you won’t. Some days your Corkscrew will be bigger than other days. Focus on the control. 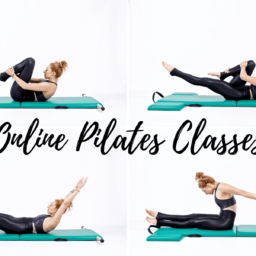 There are several ways you can do Corkscrew on the Mat depending on your level of Pilates practice and even the type of mat you have in your space. As you play with this exercise, explore where your range of motion is each day and also what is the best version for you. Some days you will roll up into a shoulder stand, maybe other days you won't. Some days you'll be able to really reach from one side to another and other days you'll have to pull back. Focus more on the control and not the "bigness" of your corkscrew. As you roll back reach your arms long from your back! Sitting at the top of your mat with your legs open the width of your mat, bend both knees, grab your ankles and then one at a time or both at the same time straighten your legs until you are balancing in your start position. A more advanced way to get into this exercise is to pull in to your center, roll back like you would for the Roll-up and lift both legs at the same time and grab your ankles. Once you are up, press your legs into your hands and your hands into your legs to turn on your seat. Your arms are connected to your back and this is integral as your roll back towards your shoulder blades. Your hips will lift and your body will want to let go, collapse, and melt into the mat. But if you maintain straight arms from your back you will not get "stuck" on the mat! After you feel you have the exercise you can add to it! There are three variations. The first is with open legs rolling back and up three times. Then hold your balance and open and close your legs three times. Finally, close your legs, grab your toes and roll back and up three times.